In the compact SUV segment, the Hyundai Creta is popular among those who value creature comforts over off-road ability. That explains why the Creta’s average monthly sales figure is over four times that of the Renault Duster. In order to break the Creta’s monopoly, Renault will soon launch the Captur in India, and Volkswagen might have the T-Cross. What’s the T-Cross all about? The Volkswagen T-Cross is based on the MQB A0 platform. The same platform also underpins the latest sixth-gen Polo. 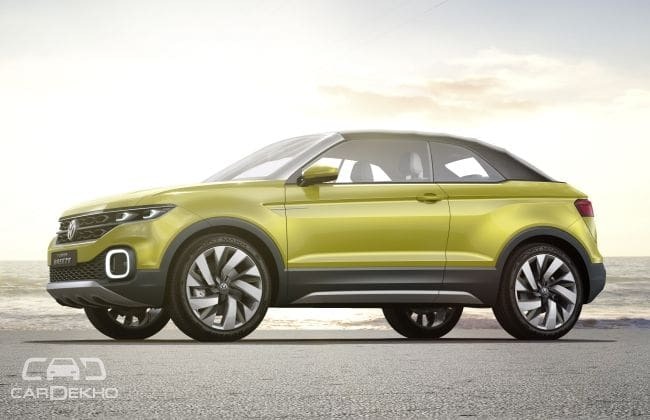 Volkswagen will reveal the production-spec T-Cross SUV in 2018. The German carmaker showcased a convertible SUV prototype in 2016 called the T-Cross Breeze. The upcoming SUV will be based on this prototype. The T-Cross Breeze concept measured 4133mm in length and 1798mm in width, and had a wheelbase of 2565mm. While the T-Cross Breeze’s wheelbase is the same as the latest sixth-gen Polo’s, it is longer (by 80mm) and wider (47mm) than the hatchback. When compared to the Creta, the T-Cross Breeze is smaller in length by 137mm and in wheelbase by 25mm, but it’s wider by 18mm. In terms of dimensions, the T-Cross SUV is expected to be in the same ballpark as the T-Cross Breeze. But the Indian version might not necessarily be the same as the one that VW launches abroad. That said, it is unlikely that the T-Cross will measure under 4 metres in length when launched in India. In his brief conversation with us, Knapp told us that they’re looking at a complete Indian solution for the T-Cross SUV. It could mean that Volkswagen is eyeing to source more components from Indian vendors to keep manufacturing costs in check. He also mentioned that VW is studying the Indian market very closely, and might make necessary variations in their upcoming products to suit Indian tastes. This could mean that the India-spec version of the compact SUV will have a different set of features when compared to the one that will go on sale in Europe and other markets. Since T-Cross will be based on the new Polo, does it mean that the sixth-gen Polo is coming to India too? A careful yes from our side, not Volkswagen’s. The interesting bit is that Volkswagen is not denying it. Currently, the VW Group has more than a handful of products based on the MQB platform in India. They also have plans to launch more vehicles based on this platform. This could mean that the German carmaker and its subsidiary, Skoda, could either be producing the MQB platform or developing a re-engineered version of it here in India. Since VW has plans to double its sales in the next five years, the new products have to be rolled out in the next couple of years for sales to gather some momentum. Given the short turnaround time, expect the MQB platform to come to India soon, as it is or with some changes. Skoda would probably have that answer!